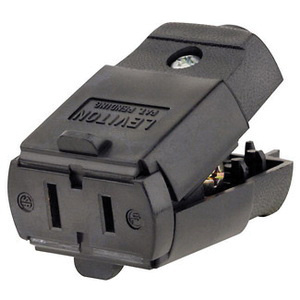 Leviton Light Duty Clamptite® Residential grade, polarized straight blade connector has 1-piece hinged design with steel and zinc plated assembly screws. It is moisture/chemical-resistant and has terminals that accept flat wire SPT-1 and SPT-2, 18 to 16-AWG and round wire 18 to 16-AWG. Straight blade connector meets UL and CSA standards.